At 0800 UT, (1:00 am Central Standard Time) a large burst of solar wind hit the earth and triggered the largest geomagnetic storm of the year thus far. There are a couple of scales to measure how big a disturbance it created. One of them is the Geomagnietic Storm scale used by the NOAA. On this scale, the burst registered as a G3 or a "Strong" storm. (G5 is the strongest.) A burst this strong can cause aurora as far south as 50° longitude! Unfortunately for sky watchers tonight, the storm looks like it has subsided from "strong" category so probably no aurora in the Twin Cities or other mid latitude cities tonight. 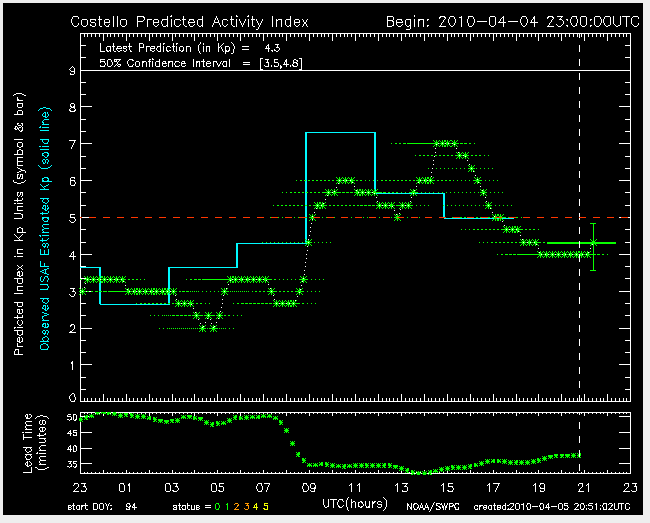 Activity has already fallen to G1 or Minor level. Here's the graph of the storm strength from the NOAA/NWS Space Weather Prediction Center. It is interesting to note that the storm peaked at night just as many birds were migrating. Why is this important? While reading up on the scale I learned that even at the minor level, migratory animals are affected by geomagnetic storms. Birds can sense the magnetic field of the earth and use it for navigation during migration. Geomagnetic storms disturb the field and confuse birds who rely on it as a navigational aid. Since spring migration is starting to gear up I wonder what effect this storm will have on birds heading our way? Could we end up with some strange migrants who get off course? The effects on migration would likely be temporary as birds use multiple tools to aid navigation. Birds migrating under daytime overcast skies with no sun are most likely to be affected. If a magnetic storm remains at level G1 or higher AND there is persistent cloud cover we could expect some birds to get off course. The longer it lasts, the further off course they could become. 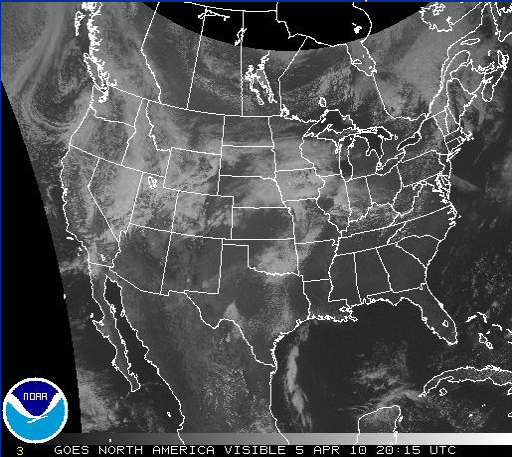 The afternoon NOAA GOES satellite image of visible could cover did show cloud cover over a good portion of North America while the storm was still at G1 levels. For night migrants, cloud cover isn't an issue. Multiple research studies have shown that when geomagnetic information and celestial information disagree, the geomagnetic information is dominant which is bad news for migrating birds under clear night skies during a geomagnetic storm. It looks like as of sunset tonight the storm has subsided so birds are in the clear for tonight. Hard to say when the next big storm will come. Maybe it's get the loons to the twin cities sooner. A girl can hope. I hope there are some great accidentals... stalked some sandhill cranes this weekend. I know, not that great a find, but very fun to get as close to them as I did. They were very noisy. Ren-The loons are already around. I haven't seen one but started hearing them something like two weeks ago! Jamie-Nice on the sandhill cranes. Those are always a favorite of mine.